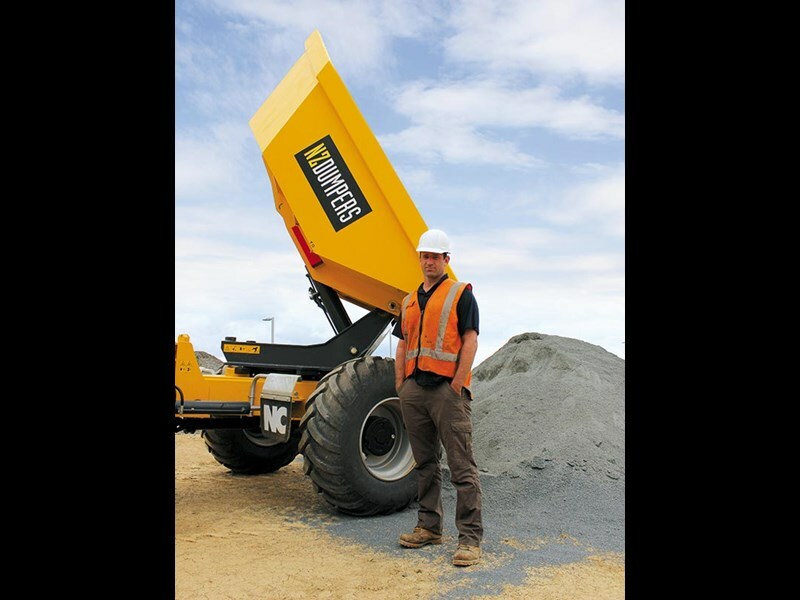 "Site dumpers are incredibly popular in the UK and I could instantly see a number of applications back here in New Zealand where they would work very well," says Brooker. 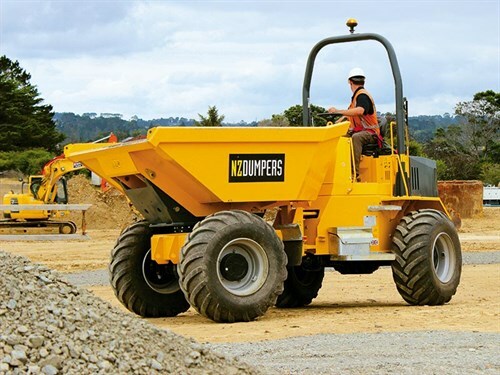 NZ Dumpers has been in operation for three years now and has managed to capture almost all of the rental market for the Greater Auckland region. Spot a site dumper on one of the city's many worksites and you can be sure it's probably an NZ Dumpers-supplied machine. 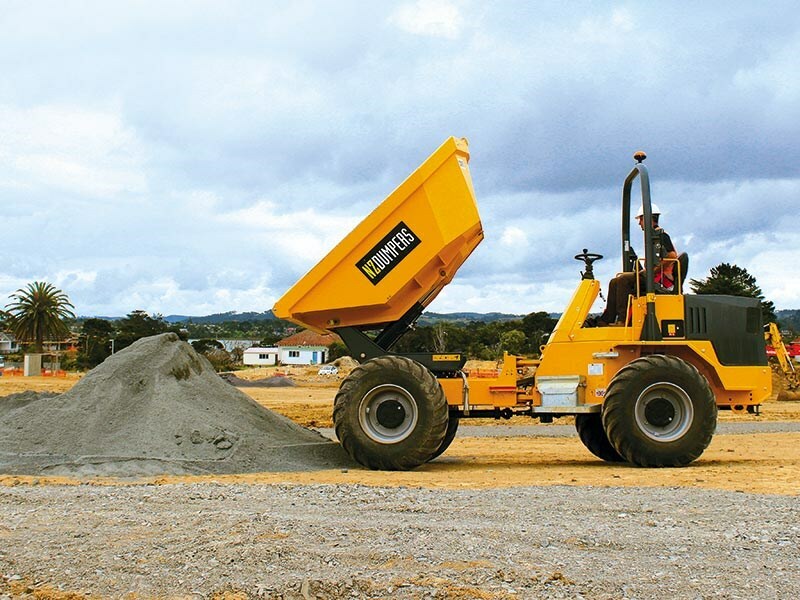 "In addition to their robustness, site dumpers are well-known for their operating efficiencies too, by switching the onus from size to utilisation big savings can be generated." Despite a steady start, Brooker says the efficiency side of things is still an education process for the industry. "It's about teaching fleet managers that the proper utilisation of a small machine is better than having a big machine parked up." 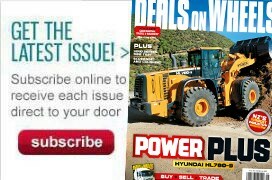 "I see 20-tonne diggers everywhere around Auckland, but half the time they're not moving. If you had an eight- or 12-tonne digger instead, paired with a site dumper, that combination would move just as much material, if not more. "One company I dealt with were using a 30-tonne ADT to move the same amount of soil that two six-tonne dumpers would have moved at a quarter of the price per hour. "On another site a foreman confidently told me that site dumpers were too small for his site, while behind him he had four 30-tonne ADT's lined up waiting to be loaded. At $120 per hour each, that foreman was flushing close to $500 per hour down the drain. "You see six wheelers everywhere too, but a nine-tonne site dumper will carry just as much as a six-wheeler at a third of the cost. Kiwis have a 'bigger is better' mentality sometimes, but that doesn't always pay dividends, depending on the nature of the operation." Brooker has purchased two site dumpers through Porter Equipment so far, the NC machines joining a hire fleet numbering 21 units in total. "I'm impressed by the layout of the controls and some of the individual features on the NCs," Brooker continues. "They've really thought about certain aspects of the design, like the operator's seat that can flip forward to keep the rain off when not in use. "I'm also impressed with the onboard security the NCs feature. On urban work sites, most construction machines are broken into for their batteries. Other brands have the battery within the bodywork, meaning that more body panels get damaged when someone attempts to rip it out. The NC though has a sturdy lock-box compartment on the outside of the machine for the battery." Brooker has been impressed with the Porter Equipment offering, saying that the two NC machines on the fleet both arrived with one year warranties and robust components from proven manufacturers. "Site dumpers are pretty unique as far as construction gear goes, in that they are always manufactured from a collection of different parts. There's no such thing as a wholly engineered-from-the-ground-up site dumper with one supplier providing engine, axles, steelwork etc. "When I found out that NC dumpers utilise a lot of quality components, I was willing to give them a go. The back-up of the Porter Group gives me extra peace of mind." 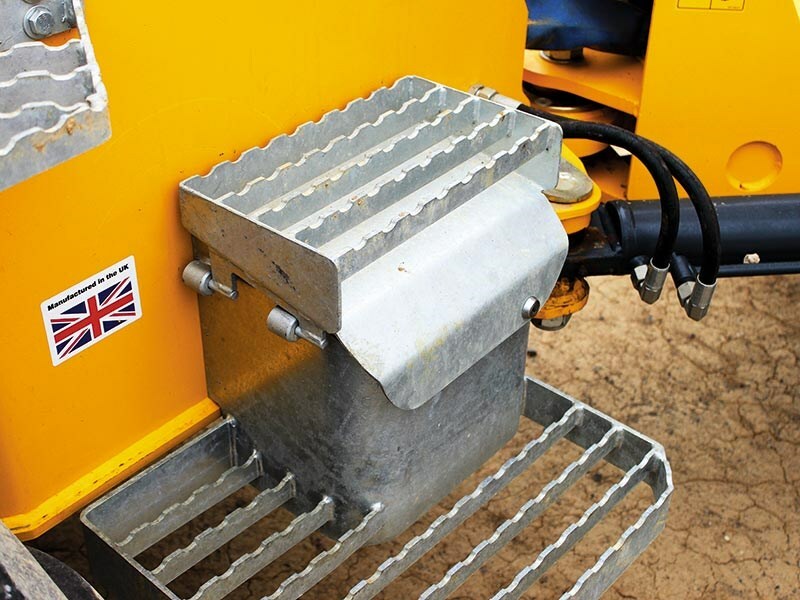 The swivelling mechanism on the NC dump bin comes into its own in narrow work site environments (some of Brooker's machines have been hired by companies working alongside main arterial routes), or where backfilling trenches becomes a major component of the job. Despite the obvious advantages this feature presents – especially in the three- and six-tonne machines – Brooker is quick to point out that the articulation at the centre of the NC dumpers means you can still turn the wheel to get the bin into place. 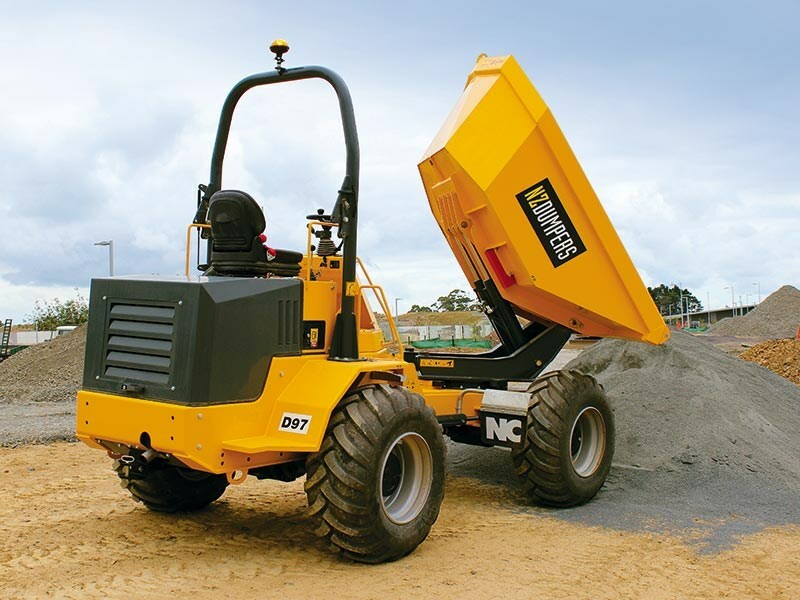 NZ Dumpers has three-, six- and nine-tonne payload machines in both swivel and straight tip configurations for hire. With heaped bin capacities for each machine at 1.87m3, 3.52m3 and 4.60m3 respectively, they provide an extremely cost effective and useful earth moving solution. Brooker says every time he gets a dumper out with a company, it's hard to get it back because of their popularity with operators and project managers alike. He has a growing number of converts to the machines among the civil construction scene, with site dumpers now working in almost every major development in Auckland. "Site dumpers are essentially just massive wheelbarrows after all," laughs Brooker. "And I can't think of many jobs that you could complete without a good old wheelbarrow."